Cramond Island, which is leased to the club, lies about three-quarters of a mile NNE of Cramond and is connected to the mainland at low water by sandbanks, a raised sewer pipe and a concrete boom which shows approximately 1m at HW. The distance from Ferry Cottage to Seal Rock at the N end of the island is one nautical mile. To permit the passage of vessels through the concrete boom, there is a gap marked by a white-painted arrow and a tide gauge. The depth of water here is about the same as the river bar. Vessels should not attempt to pass through any other gaps. Depending on wind direction, good anchorages can be obtained on the west side of the island in Duckhouse Bay or in the bay to the south of Middle Point. Both these bays dry at low water but at high tide have sandy beaches ideal for picnicking. An alternative anchorage may be found on the east side inside the Partan Rock, which dries 1.1m. The position of this rock is indicated by white painted transit marks on the island. Sand and mud banks dry out for a mile offshore from Cramond, and keelboats should stay in the deep channel when more than two hours before or after HW springs, or one hour either side of neaps. 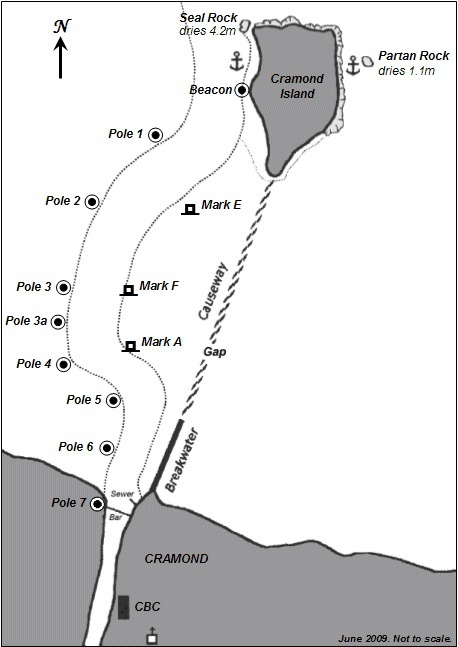 The west bank of the channel is marked by poles which should be left 3m to starboard on the way in. 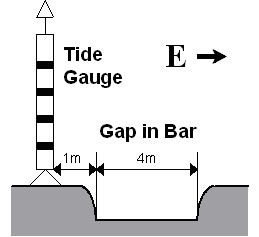 The tide gauge on the bar beacon indicates the depth of water over the bar. There is a gap in the bar immediately to the east of the bar beacon which should be used if possible. Craft leaving the river have right of way. The Club will not be held responsible for absence or alteration of the channel marks which are intended as aids to pilotage only.